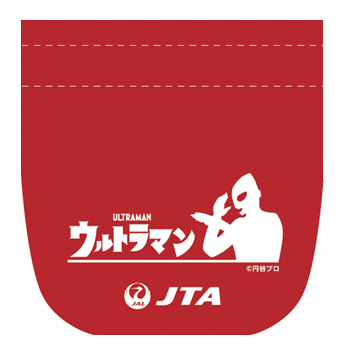 Tsuburaya Productions has provided SciFi Japan with information and photos of their new Ultraman JET (ウルトラマンJET). 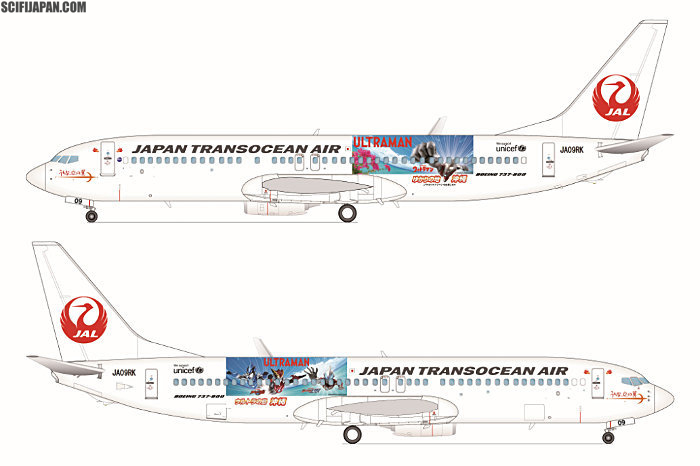 As a promotional tie-in with Japan Transocean Air (JTA), a commercial airline based in the city of Naha, Okinawa Prefecture, the 165 seat Boeing airliner is emblazoned with the images of the original Ultraman and the heroes from the most recent Ultraman series, ULTRAMAN GEED (ウルトラマンジード, Urutoraman Jiido, 2017) and ULTRAMAN R/B (RUEBE) [ウルトラマンＲ／Ｂ(ルーブ), Urutoraman R/B (Ruubu), 2018]. 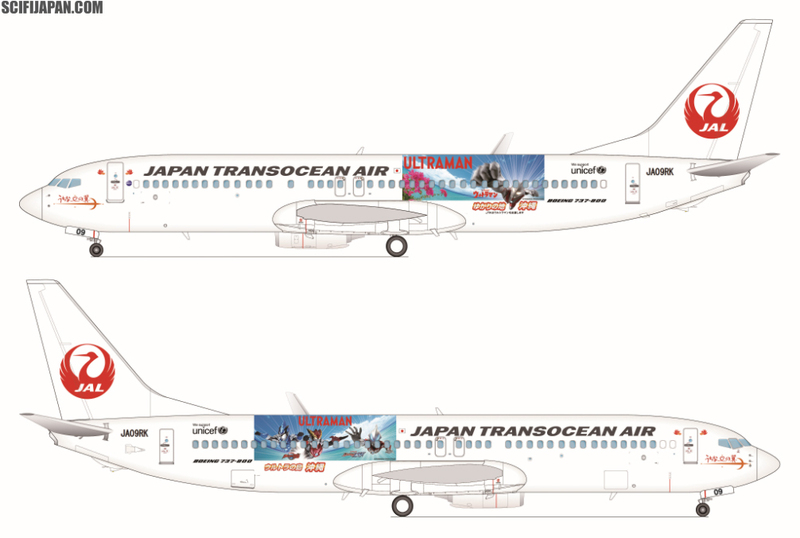 The Ultraman-themed aircraft will fly between Okinawa, the surrounding islands and the Japanese mainland though April 2019. The JTA Ultraman flights were arranged in partnership with the General Incorporated Foundation, Okinawa Convention & Visitors Bureau (OCVB) and the Minamihabara-machi Tourism Association to promote tourism to the region. Okinawa is the birthplace of the late Tetsuo Kinjo, the screenwriter who was instrumental in the creation of the Ultraman Series (see below for more information). 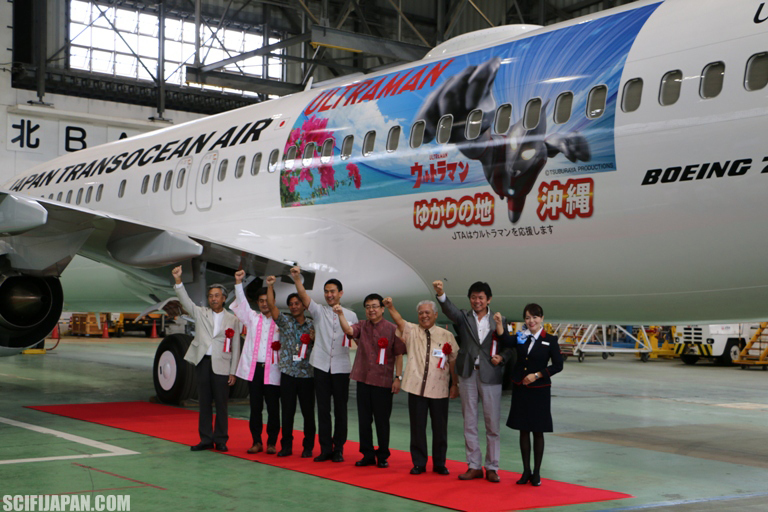 An announcement ceremony for the Ultraman JET was held at the JTA Maintenance Center on Monday, October 29, with flights beginning at 7:15am the next day. 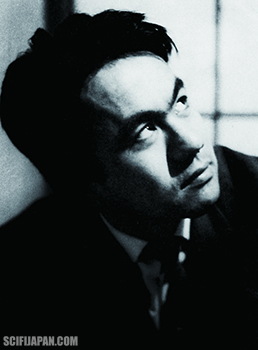 Tetsuo Kinjo. Photo courtesy of Tsuburaya Productions. Tetsuo Kinjo (July 5, 1938 – February 26, 1976) was a screenwriter from Minamihabara-machi, Okinawa. In 1963, while studying Literature at Tamagawa University in Tokyo, Kinjo met with the “God of Special Effects” Eiji Tsuburaya and was hired by Tsuburaya Special Effects Productions (now Tsuburaya Productions) as a writer. As a youth in his twenties, he played key roles in the development and production of the television series ULTRA Q (ウルトラQ, Urutora Kyuu, 1966), ULTRAMAN (ウルトラマン　空想特撮シリーズ, Urutoraman: Kuso Tokusatsu Shirizu, 1966-67) and ULTRA SEVEN (ウルトラセブン, Urutora Sebun, 1967-68) — the foundations of the long-running Ultraman Series. Kinjo was not only one of the main writers, but also worked on set and as a coordinator with television stations that were broadcasting the shows. After working on non-Ultraman series such as MIGHTY JACK マイティジャック, Maiti Jakku, 1968) and OPERATION: MYSTERY (怪奇大作戦, Kaiki Daisakusen, 1968-69), Kinjo left Tsuburaya Productions and returned to Okinawa in the wake of the United States ending their occupation of the island. He continued to work on screenplays, directed stage plays, and also appeared on radio and television programs. He was responsible for the design and direction of the opening ceremony for the Expo ’75 World Fair held on Okinawa, and was active as a bridge between Okinawa and Japan. At the age of 37, Tetsuo Kinjo tragically fell to his death while doing repairs to the roof of his home. In 2013, his former writing study in his hometown of Haebaru was transformed into the “Kinjo Tetsuo Museum”, with displays of Kinjo’s original scripts, photos from the production of the early Ultraman Series, and more. Ultraman JET design (right side) with Ultraman Blu, Ultraman Rosso and Ultraman Geed. Image courtesy of Tsuburaya Productions.